Paul Tsui Ka Cheung was born in Sai Ying Pun, Hong Kong on Nov 5 1916. He had a very full life, including some dramatic times during WW2. He started work in Hong Kong as a Cadet Officer Class 2, on Probation, in 1948 working in the Import and Export Department. He enjoyed a long career of great variety with the Hong Kong government. He finished his working life as Commissioner for Labour and Mines and retired in 1973. He died in Hong Kong in 1993. 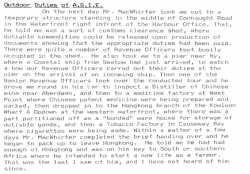 The latter chapters of Paul’s memoirs are of some interest to us as they cover the period of his work in Hong Kong. I will endeavour to post relevant excerpts over time. Let’s start with this one, when he had just started work in the Import and Export Department. He writes about being taken around various areas of HK Island with senior officers. 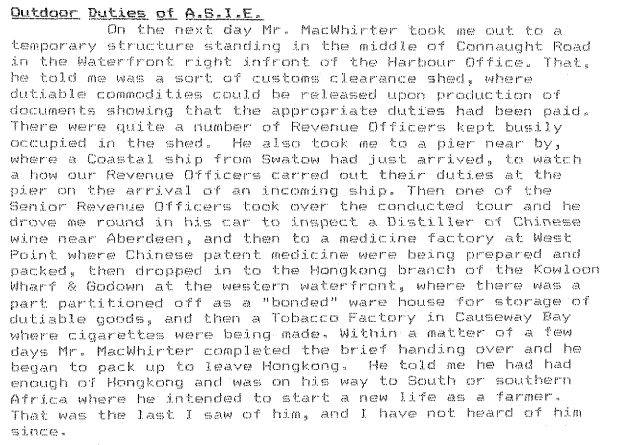 Mr MacWhirter was the Deputy [Director?] in the Department. There’s no further information about their names or exact location. But hopefully this will be forthcoming.